Iraq is changing rapidly and as life is returning to normal, so too is economic activity. The country has entered a new, positive phase. Demand for goods and services is growing, and the country is proving why many believe it to be one of the world’s most attractive markets. Iraq offers almost unparalleled opportunities to international corporations and investors. At the same time, Iraq can finally benefit from foreign investment into its economy. Iraq’s needs are broad, range across all sectors, and include railroad and port projects, residential and urban development, electricity plants, refineries, hotels, and telecommunications infrastructure expansion – just to name a few of the larger initiatives. The NIC has a unique view on the country’s investment needs. Through Provincial Investment Commissions (PICs), which were established under the same law as the NIC, it can support the needs and priorities of every province. Similarly, the NIC has full access to national-level bodies including parliament, ministries, and the Prime Minister’s office. This has enabled the NIC to draw critical insight into the needs of the Iraqi people and economy. The NIC uses this position to promote investments that can address the country’s most critical needs. Attracting private capital and modern technology, and pairing it with business management experience is essential to this mission. Logistics support: NIC staff will help potential investors with business visa applications, making hotel reservations, and arranging for airport pickup and hotel transfers. NIC staff will also provide investors with market research, details on the economic climate, potential translation services and other necessary information for potential business ventures. 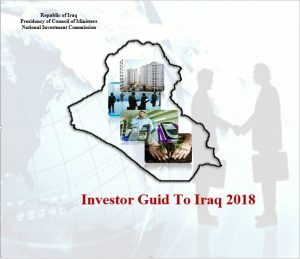 Business process support: NIC will be able to assist investors with navigating domestic guidelines and regulations including the drafting of a feasibility study, required in order to submit an investment proposal, and registering as a company with the Ministry of Trade, required to do business in Iraq. Introductions: NIC can introduce potential investors to various public and private sector contacts to learn more about investment opportunities. NIC can also help in creating a business network with domestic partners. The NIC’s role is not limited to managing international investors. The interaction and exposure the NIC has with the private sector along with its role as liaison with international business gives the NIC the insight required to make solid policy and regulatory recommendations that can improve the business climate in Iraq. In the long-run, this will be a critical role for the NIC and has the potential to build on recent successes in improving the business climate in Iraq. Investment in Iraq has tremendous potential to benefit both investors and the Iraqi people. 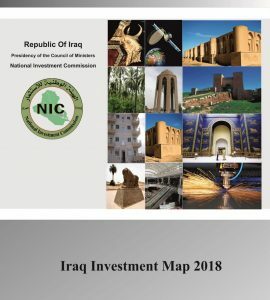 The NIC’s responsibility is to connecting investors with profitable projects that address Iraq’s most critical needs, and to ensure that the environment exists for simple entry into the country.